Nano Silver - Thanks to advanced technology, a new and more powerful form of silver is now available. Nano Silver has been found to work synergistic-ally with medications. patented Nano-Silver technology. (US Patent 7,135,195) This new technology is called SilverSol Technology. 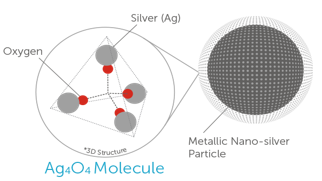 This new technology has created an engineered Silver Nano particle. More than 190 independent studies from over 60 different labs; private labs, US government labs and university labs. As evidence of their safety and efficacy, their innovative Nano-Silver products have received both FDA clearance and EPA approval. These studies are based on 10 PPM. Most silver products work by chemical action, requiring direct contact with microbes to have any positive effect. SilverSol Nano-Silver technology works by catalytic action which allows it to first destroy pathogens and then to instantaneously recharge and destroy again and again. SilverSol found in our Silver Products is a powerful, totally safe and non-toxic form of silver that destroys thousands of times more pathogens than a simple colloid or ionic silver.